Anyways, we had originally intended to travel with three cars ‘for safety’ (breakdowns, bandits, etc..). By the time we left we were two cars. 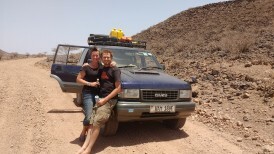 By the time we got to Turkana we were one car! Todd, along with one car, had to turn back due to Malaria. 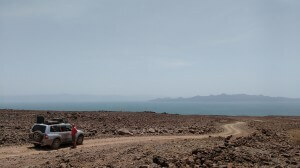 Having come so far, we were reluctant to turn around before heading north up the lake to Sibiloi National Park, so Maciej, Mouse, Zoë and myself headed off in my not so ideal car. 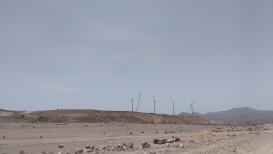 Up until south Turkana, the road had been dirt but not so bad. After we set off, we could barely find a road at all. 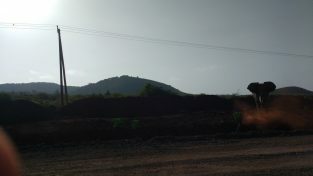 No gas, no water, no track, no people for hours, no one who even spoke Swahili. We often drove for an hour or two wondering if we were heading in the correct direction. A break down would have been catastrophic. I fully expect parent of the year award for this one! Anyways, we didn’t get lost, and we didn’t break down, and we did have have suitably adventurous trip. 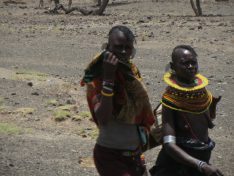 The people around the lake looked straight out of a National Geographic magazine – several different tribes including the Turkana and Samburu with fantastic traditional costumes. 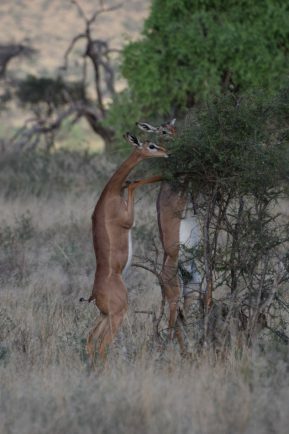 They didn’t like pictures being taken, so I only got one picture, for which I got told off! It was hot! I didn’t wear a shirt for about 4 days. We often woke up at 3am in the morning in a pool of sweat. Todd got diagnosed with Malaria at a clinic on the way out of Nairobi. He took the meds and we hoped he would feel better. 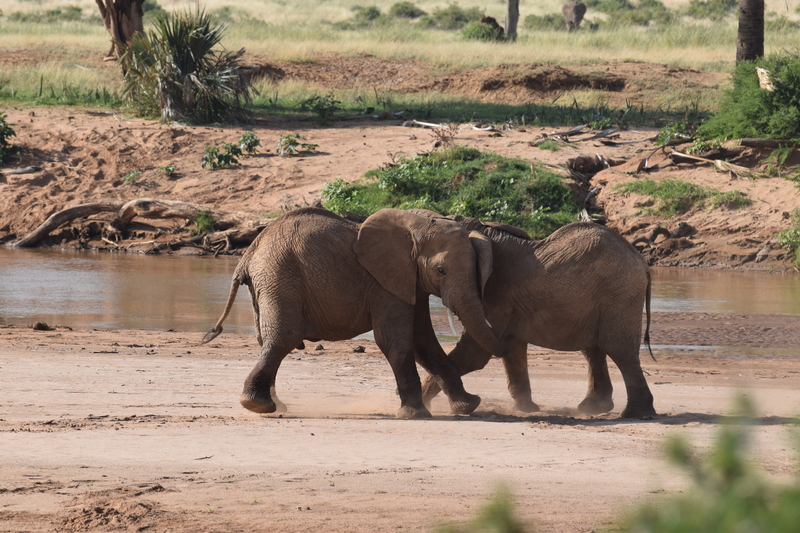 We stopped first in Samburu where we saw cheetah, leopards and of course lots of elephants. 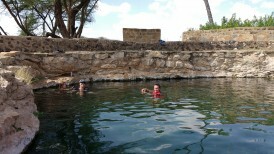 Todd, Ryan and Mouse stayed in Samburu to give Todd some rest time. 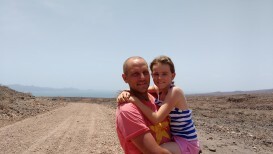 While Maciej, Zoë and I headed to Marsabit National Park, where we were enjoyed the crater lakes and the general remoteness of the place. From there we met the rest of the group and drove to south Turkana, where Todd and Ryan decided they’d head back to Uganda (I’m glad they made it to the lake!). The rest of us headed up to Sibiloi – a full day up, two days there and a full day back. My shocks got completely destroyed on the trip up to Sibiloi and the car sounded like it was going to completely come apart on the 600kms of washboard road to Baringo. Fortunately for us, it made it, though it spent an expensive week at the mechanic upon our return. 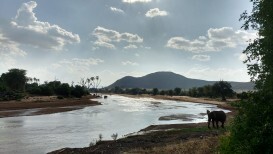 We spent our last couple of days in Baringo where we stayed with Mouse’s dad and had a day fishing on the lake – a pleasant end to our trip. Catching a fish on Lake Baringo. Playing darts at Island Camp in Lake Baringo. Playing a scrabble like game with Zoë, Maciej and Mouse. 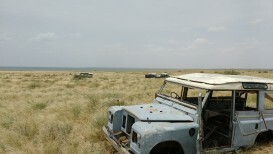 Land Rover graveyard at Koobi Fora Research site. 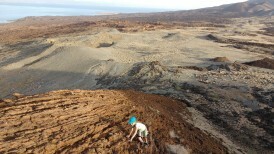 Climbing the South Island in Turkana. 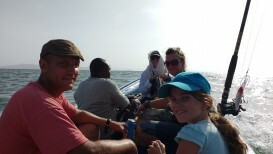 Organizing a boat in Turkana. This massive wind farm is being built near the lake. Only flat of the trip. Stuck in Koobra Fora, we had to use 6 sand plates to get out. Playing games with Zoë, Maciej and Mouse. 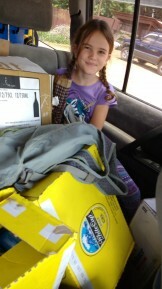 At the beginning of the trip Zoë was packed in by, ughh… supplies. 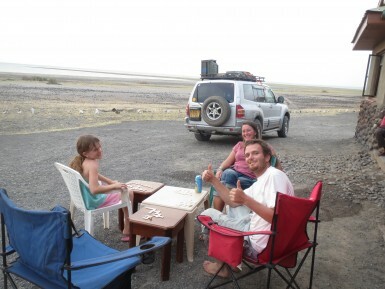 It was hot in Turkana! I didn’t wear a shirt for 4 days! The people there are the real deal! A fantastic variety of tribes living very traditionally. 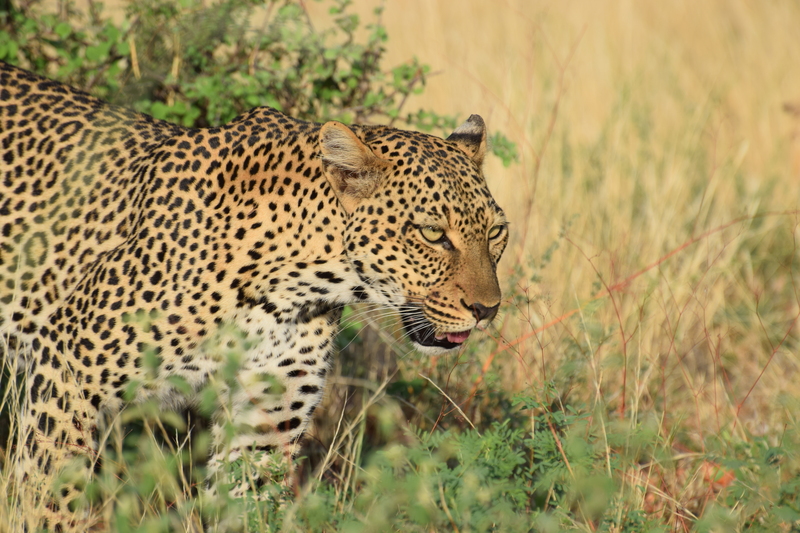 We saw Leopards and Cheetah in Samburu. 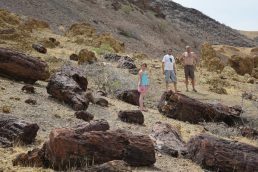 Petrified forest in Sibiloi National Park. The only picture we got of the colorful local tribes. One upset elephant near roadside near Marsabit.